Days after the ratification of the Prespes Agreement by the Hellenic Parliament, both Greece and the Former Yugoslav Republic of Macedonia have been the recepients of international praise for putting an end to a decades-long dispute. The vote may have completed a long process of negotiations and political debate, but it is only the first step in an equally long process that will see the newly renamed ‘Republic of North Macedonia’ become a member state of NATO and the EU. For starters, the new name is not yet valid. The first step is for Greece to send a ‘note verbale’ to the FYROM Ministry of Foreign Affairs, officially informing of the ratification. From then on, the matter will go to all international organisations implicated; the first one to receive an official notification is the United Nations, which was the mediator during the negotiation process. The next step will see the NATO accession protocol tabled to the Hellenic Parliament, sometime in February or Early March. Once this is ratified, it will mark the official start of the implementation of the Agreement, effectively allowing North Macedonia to participate in NATO as a guest. Greece has agreed to be the first to sign, which will activate the name change and pave the way for a process that will increase the alliance’s numbers to 30. The Protocol has already been sent to the ambassadors of the NATO members in Brussels since Monday, speeding up a process that begun unoficially in July, right after the Agreement was signed. Once the Protocol is signed, FYROM’s constitutional amendments will irrevocably come into effect, and the country will start using the name ‘North Macedonia’ in all its bilateral relations; all countries and international organisations will have to recognise it under this name. 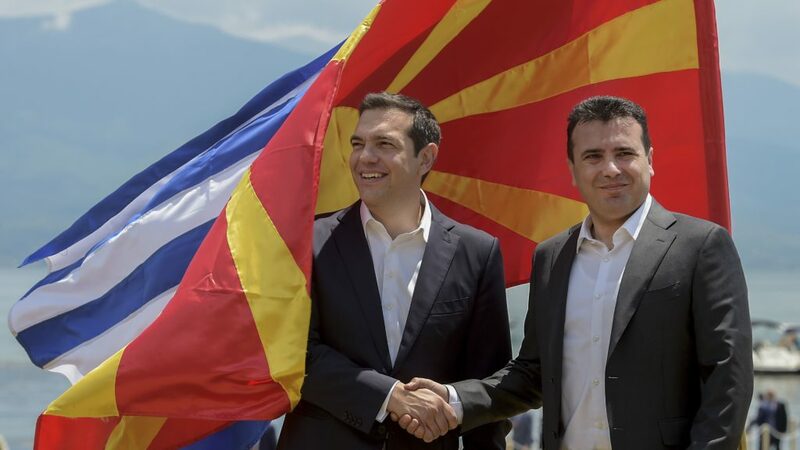 At the same time, all official documents, both regarding internal policy and international relations should bear the name ‘Republic of North Macedonia’, instead of ‘Macedonia’ – a change that should be completed within five years from the date of the Prespes Agreement signing. All 29 NATO members will have to ratify the protocol, following due procedures in each country. After NATO, it’s the European Union’s turn to keep its promise and start negotiating with North Macedonia regarding its accession. FYROM was the first of the Western Balkan countries to start discussing becoming an EU member state, but this process froze in 2005, following Greece’s veto which has effectively blocked FYROM’s accession for 13 years. This process is expected to restart by June, at the scheduled European Council summit. However, Kyriakos Mitsotakis, leader of the Opposition in Greece, has stressed that Greece can still veto FYROM’s EU membership, and announced that he will use this right, if elected Prime Minister. As for the current PM, Alexis Tsipras, he is already a contender for the Nobel Peace Prize, along with his counterpart from FYROM, Zoran Zaev. The two leaders were officially nominated by Tunisian entrepreneur Wided Bouchamaoui, who was one of the recepients of the 2015 Nobel Peace Prize, for her work with the Tunisian National Dialogue Quartet. Bouchamaoui expressed the belief that the Prespes Agreement is a model for the peaceful and constructive resolution of bilateral and multilateral differences between neighbouring countries, one that could be used in the Balkans and elsewhere. According to SYRIZA MEP Stelios Kouloglou, the nomination has already received support from leader of Socialists and Democrats group in the European Parliament Udo Bullmann, co-president of the Greens/EFA group in the European Parliament, Ska Keller, and the European Left MEP Gabi Zimmer, all of whom are expected to move forward publicly with motions of support within the following days.